American street artist and social activist, Keith Haring, is one of the few contemporary artists that have pervaded the subconscious of the general public on a grand scale. In his too short life, Keith Haring was a prolific artist both on the street and in the studio, making him one of the true street art legends. 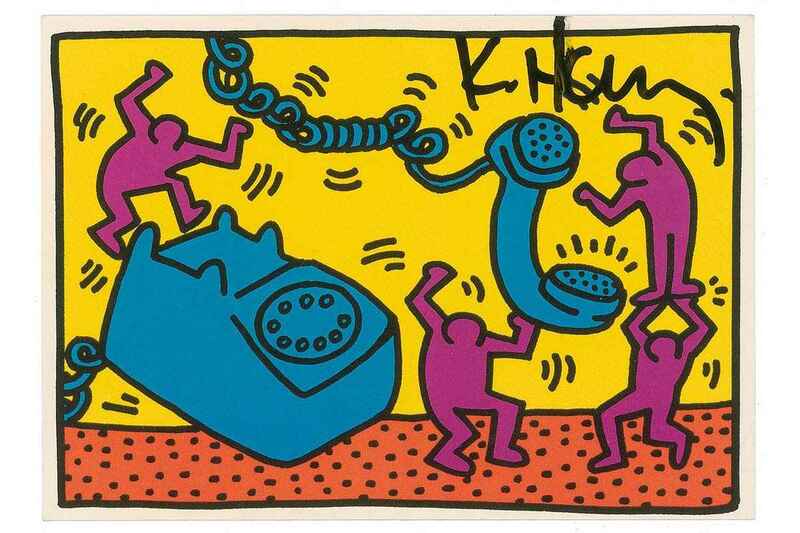 His classic colourful figures have become an iconic symbol in popular culture, instantly recognisable to many even if they don’t know the name of Keith Haring. While many of his colourful figures have instant commercial appeal, much of the work of Keith Haring revolved around themes of politics, sexuality, war, religion and AIDS, largely in response to the street culture Haring experienced in New York City. As with many street art legends, Keith Haring first took to the streets where he became known for his chalk drawings in subway stations and his iconic street art during the early 1980’s, some his most famous works being the Bowery Wall mural and his legendary Crack is Wack mural. 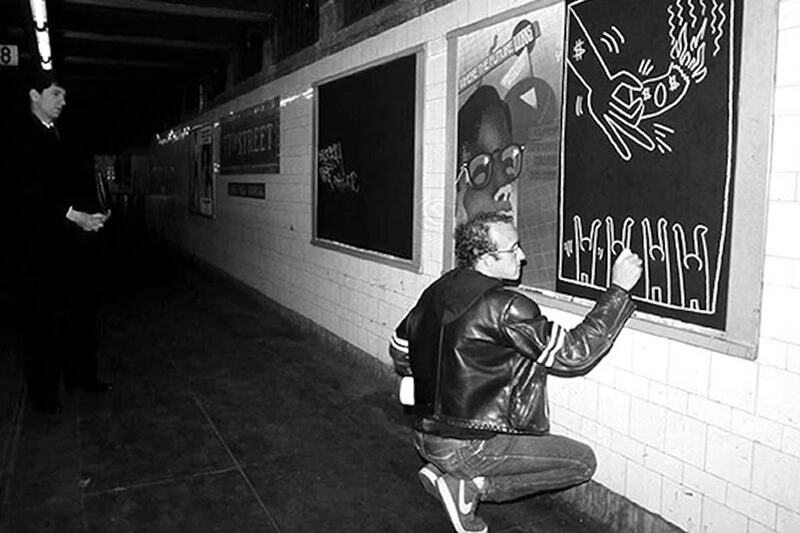 The rise to international stardom was rapid for Keith Haring, but also brought extra pressures, such as his subway art being stolen soon after completion and then turning up for sale, a problem that re-emerged with the street art of Banksy, of which you can read more in Stealing Banksy? Keith Haring also struck up friendships with other rising artists of the early 1980’s, including Jean-Michel Basquiat, Futura 2000, Kenny Scharf along with Andy Warhol, who went on to feature in some artworks by Haring. In 1987 Keith Haring was diagnosed with AIDS, creating the Keith Haring Foundation in 1989 to support AIDS organisations with his imagery and funding. 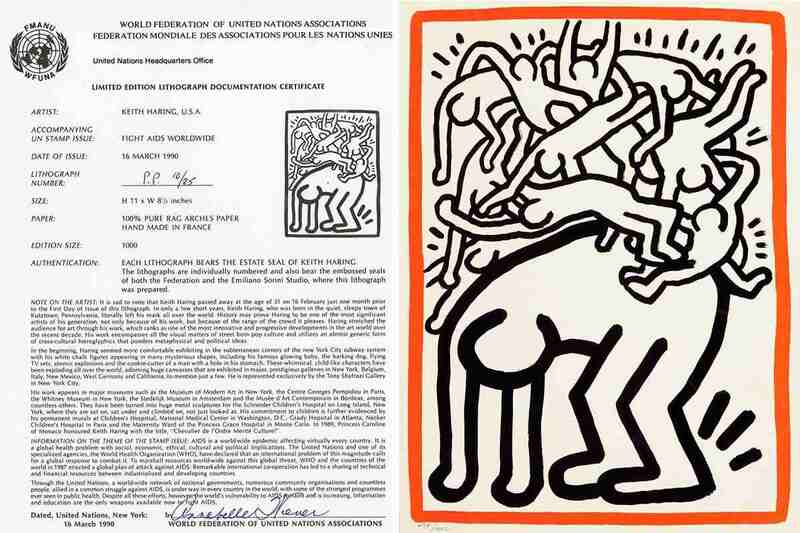 The Keith Haring Foundation was recently involved in a court case, read more about it in No Case against Keith Haring Foundation. Keith Haring died of AIDS- related complications on 16th February, 1990, aged just 31, leaving behind a legacy of amazing and iconic imagery that remains constantly popular. Keith haring remains one of the world’s most well-known street art legends, with the Keith Haring Foundation managing his estate in order to support AIDS research and patient care, along with providing educational opportunities for underprivileged children. You can read more about this in Keith Haring Foundation Donates $400,000. 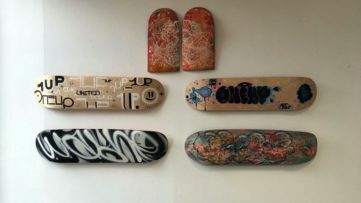 Catch up with our Street Art Legends series with Best of Basquiat Art, King Robbo Graffiti and Dondi White. Keith Haring was an unusual character among the many street art legends that emerged from the New York graffiti scene, more of which you can read about in 20th Century & the Rise of Graffiti. While many graffiti and artists took to leaving their distinctive graffiti on trains and walls with spray cans, Keith Haring could be found merging experimental performance art with his graffiti street art, usually created in white chalk on black backgrounds. The unusual approach saw Keith Haring developing his distinctive visual language and characters, while also gaining notoriety and an acceptance from the New York graffiti scene. 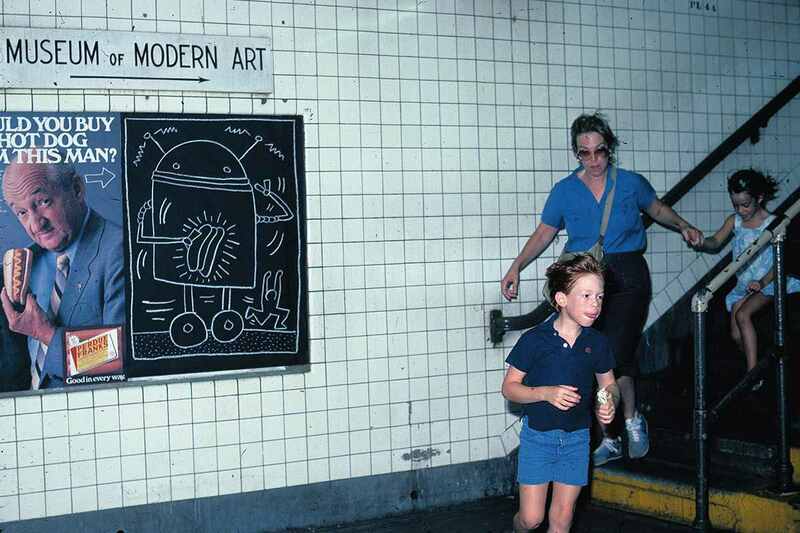 By 1984 and the work and name of Keith Haring becoming well known, the street art legend began to find that within hours of creating his subway chalk graffiti, they would be stolen and put up for sale! 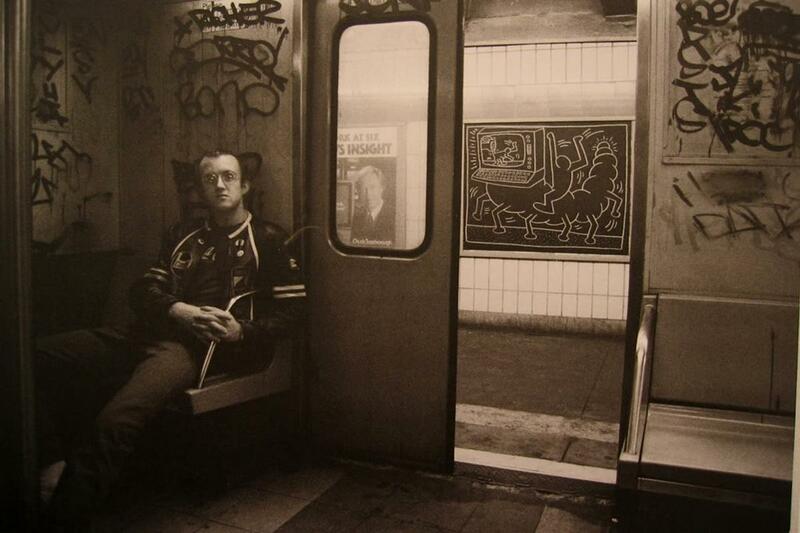 Photo of Keith Haring by Chantal Regnault. In 1982 Keith Haring created his first major outdoor mural on the Houston Bowery Wall in New York City. The iconic mural is one of the street art legends most recognisable public works and is firmly entrenched in the history of graffiti and street art, created using his signature style figures and bold colours. The partner of Keith Haring, Juan Dubose, helped out with the mural, which was created in dedication to the rising art scene in the area. 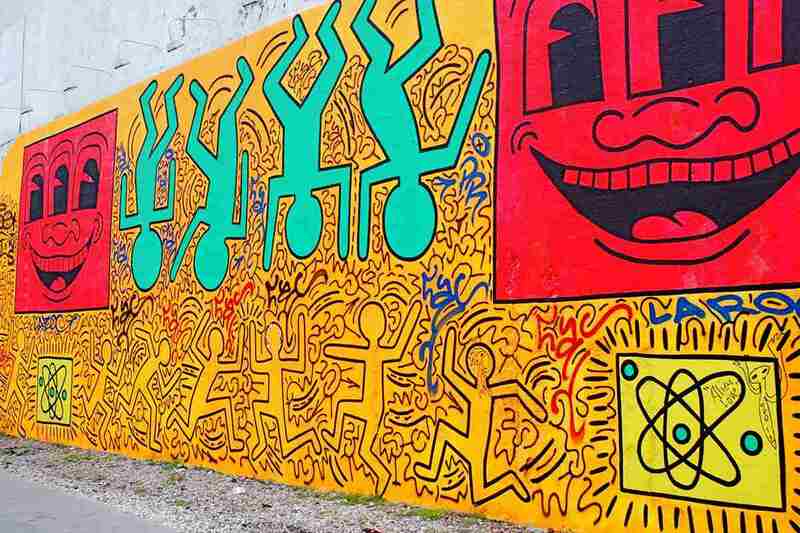 In 2008, the Houston Bowery Wall became a permanent outdoor exhibition space created by Tony Goldman and Jeffrey Deitch, the first new mural being this tribute to the original Keith Haring mural on what would have been his 50th birthday. Since then a number of well-known street artists have created murals on the wall, including Shepard Fairey, Revok & POSE, Crash and the most recent in April 2015, being Ron English, whose Houston Bowery Wall mural you see in this great video. 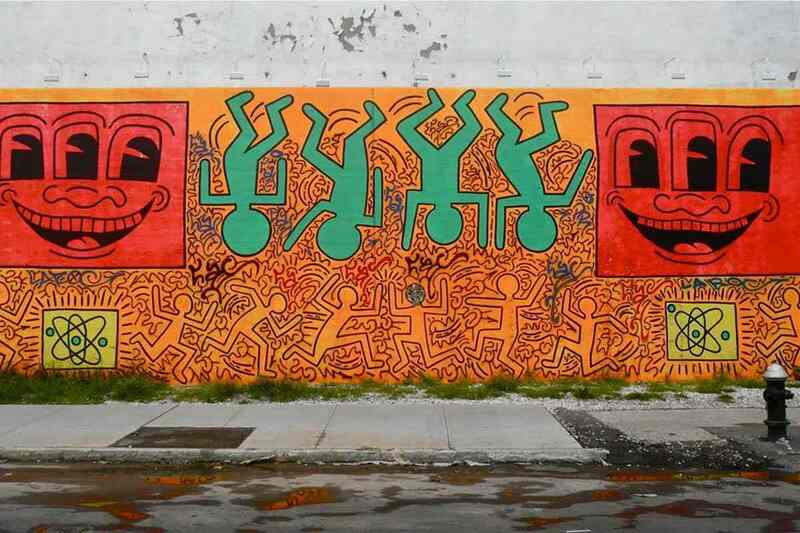 Be sure to check out more pieces by Keith Haring on Widewalls Marketplace! 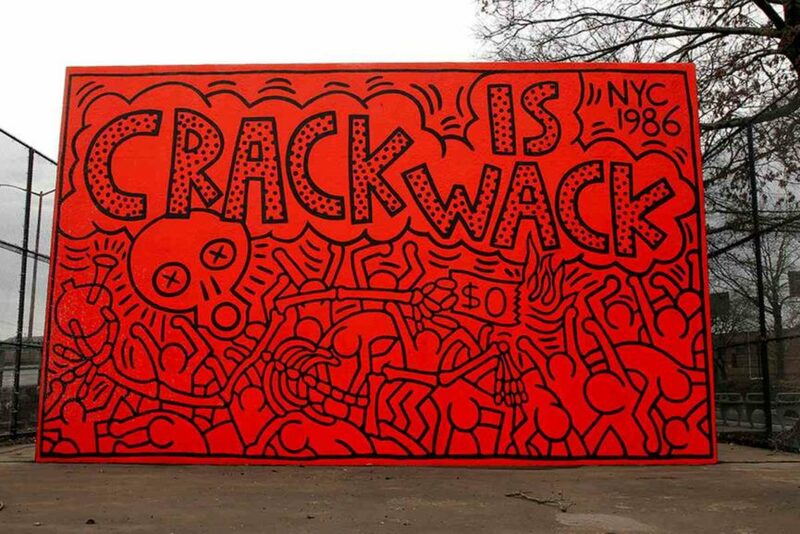 Keith Haring created his legendary Crack is Wack mural in 1986, originally an illegal piece of street art for which he was apparently fined $25, which was very quickly put under the protection of the City Department of Parks due to the status of Keith Haring in the art world. The wonderful mural simply states Crack is Wack, surrounded by the instantly recognisable imagery of the street art legend, including skulls, people, crosses and money. 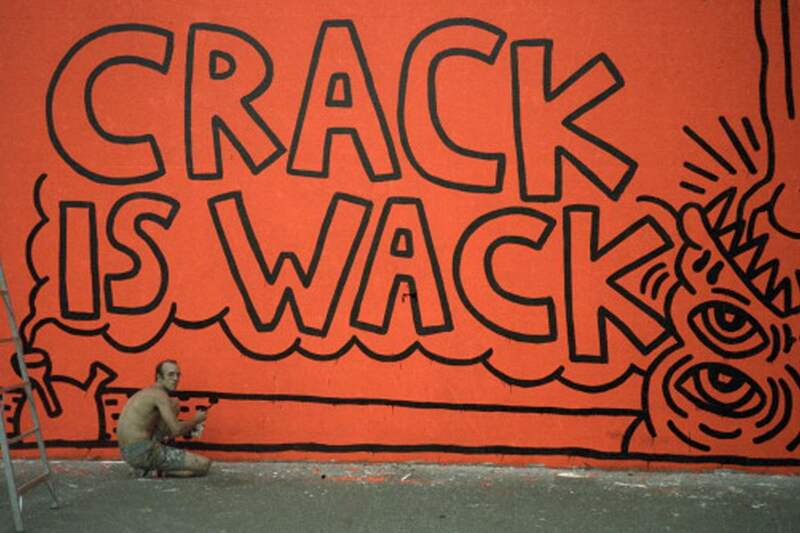 The legendary Crack is Wack mural was painted on a handball court to be found at 128th Street and 2nd Avenue, created to send out a message about the use of crack as a drug in New York City and the effect it was having. Keith Haring painted murals on either side of the handball wall, reminding passers-by that although there was a lot of creativity in the area, there were also many problems with drugs and crime. The mural was restored in 2007 and still exists to this day; check out the Crack is Wack collaboration with Reebok. Image of Keith Haring by Juan Rivera Roulette Fine Art & Getty Images. 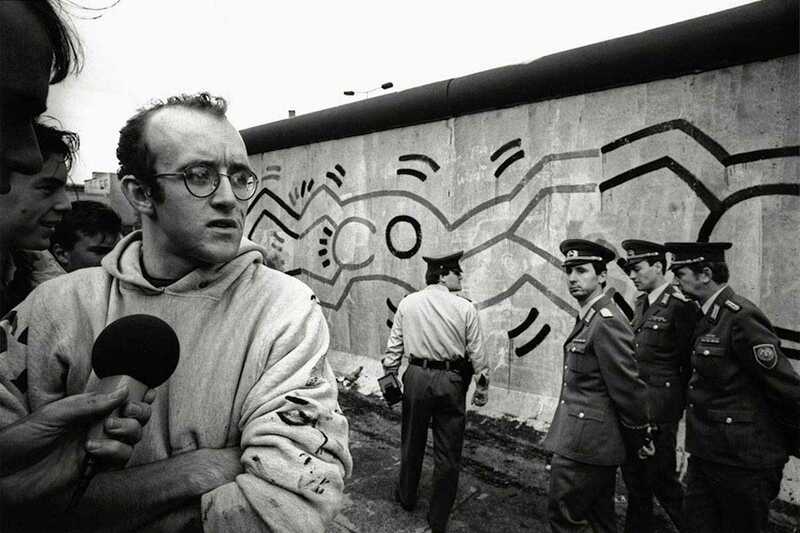 October 1986 saw street art legend Keith Haring travel to Berlin, Germany, at the request of the Checkpoint Charlie Museum. Amid a media frenzy, which included TV companies from around the globe and international newspapers, Keith Haring painted a mural that stretched for 300 metres along the infamous Berlin Wall. For the iconic mural, Keith Haring painted his distinctive figures in the form of a human chain, interlocking their hands and feet to represent the unity of people against the Berlin Wall. The mural was completed in the colours of the German flag, black, red and yellow. The mural wasn’t appreciated by all though, within hours another artist had started to paint out some of the Keith Haring mural, claiming the wall should remain grey and not be artistic. 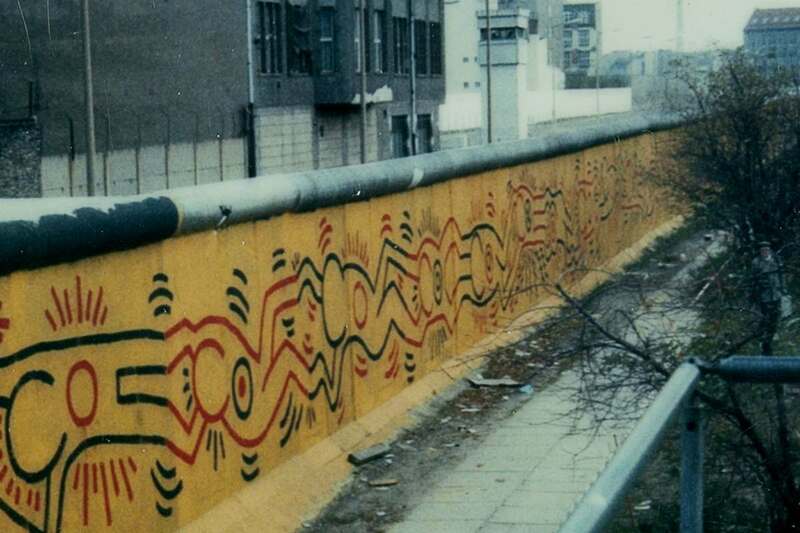 By the time the Berlin Wall was demolished 1991, the mural by Keith haring had been completely obliterated. Read more about the Berlin Wall in The Forgotten Pioneers. Photo of Keith Haring by Vladimir Sichov. Radiant Baby, also known by the names Radiant Child and Radiant Christ, is one of the most iconic images from street art legend Keith Haring. 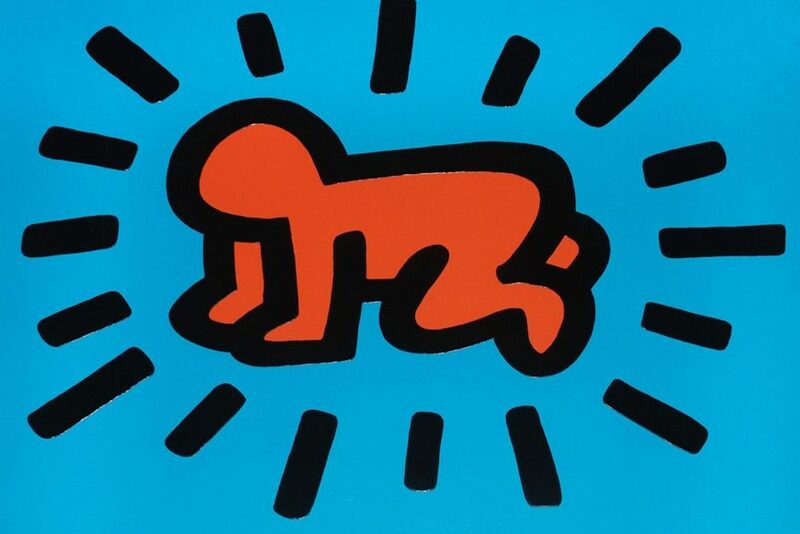 The simple character Radiant Baby first appeared in the subway graffiti of Keith Haring, the artist regularly using it as a tag to sign his street art. Radiant Baby has its origins in Christianity and Haring’s involvement in the 1970’s with the Jesus Movement, whose followers were tagged Jesus People or Jesus Freaks. Although Keith Haring left the Jesus Movement, the experience left its mark on the artworks, with the Radiant Baby also making appearances in a nativity scene and sitting on top of a mushroom cloud. Listen to Shepard Fairey discussing Radiant Baby and Keith Haring in this Keith Haring x OBEY Collaboration video. Explore other legends of street art, sign up for free to My Widewalls! Although Keith Haring was largely known for his works that had themes of war, sexuality, AIDS and politics, there was also an overwhelming feeling of religion present in many of his artworks. Radiant Baby is the obvious example, but Keith Haring regularly produced artworks that contained religious imagery such as the ones shown above. 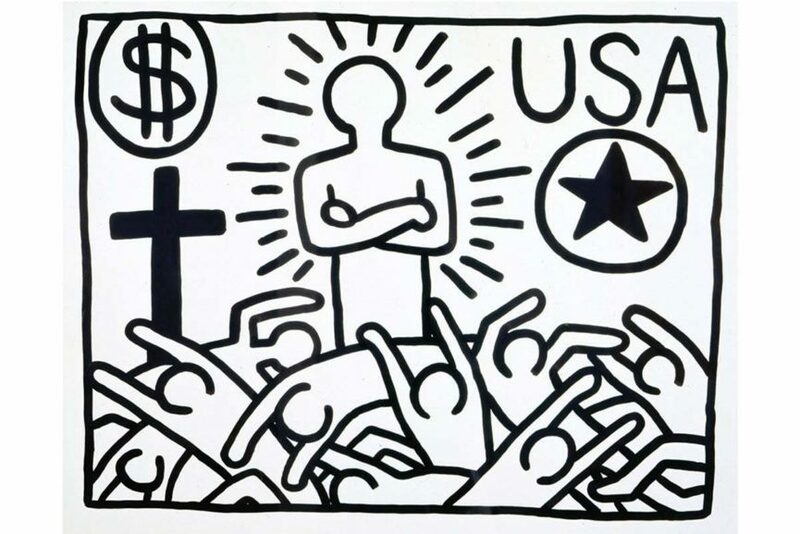 The Christian and biblical references in many pieces of his graffiti and studio based art lead some to conclude that Haring was passing comment on how religion can control one’s life and how it is about power and money. Others view it as a more spiritual side to Keith Haring, who was known to embrace life with an overwhelming optimism. 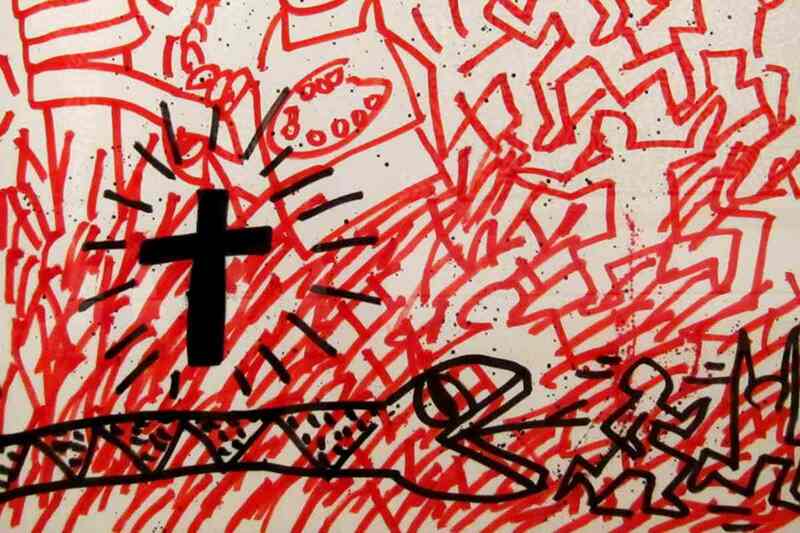 Much of the religious imagery of Keith Haring is related to Haring’s hope for the future and the Messianic powers of Jesus. Street art legend Keith Haring was diagnosed with AIDS in 1987, causing a burst of activity from the artist to create as much work as possible, with many having a focus on AIDS. 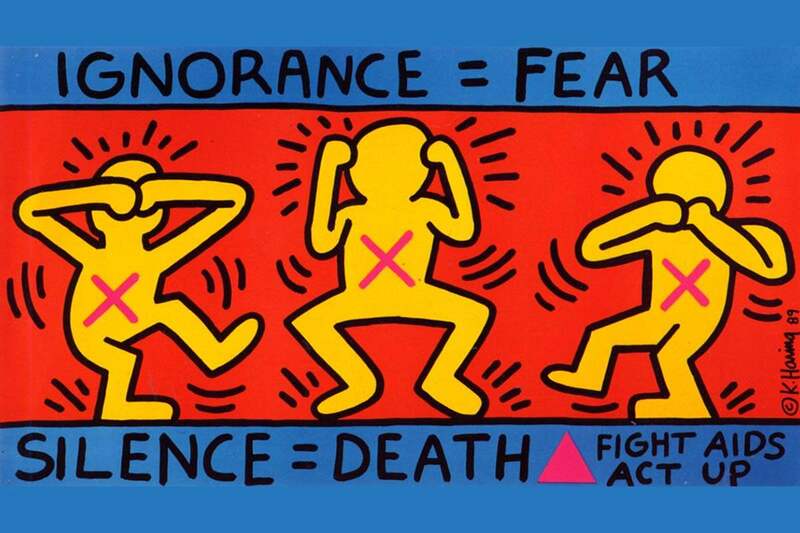 Iconic work Ignorance = Fear was completed in 1989 and features the distinctive style of Haring sending out a strong message about the AIDS epidemic, which had claimed the lives of several of his friends. These AIDS related artworks by Keith Haring were aimed at giving a voice to those who were suffering silently at the time, often using the pink triangle in the works, an image that was reclaimed by the gay rights movement after originally being used during the holocaust to identify those being targeted for homosexuality. Read more in Art Rooted in Activism – Keith Haring. Prior to the death of Keith Haring from AIDS-related complications, the street art legend helped to raise awareness and the visibility of those suffering from AIDS. Much of the work in the couple of years leading up to his death contained imagery related to AIDS combined with sexuality and included images such as this limited lithograph, produced in March 1990 shortly after his death. 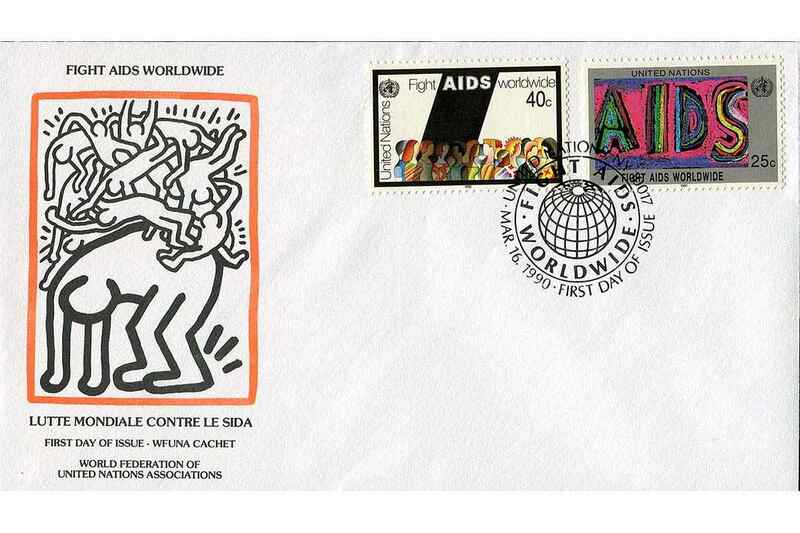 The image was used for Fight AIDS Worldwide and was included on the first day edition of a set of stamps from the United Nations. The Keith Haring Foundation continues to work in raising funds for AIDS research and patient care. 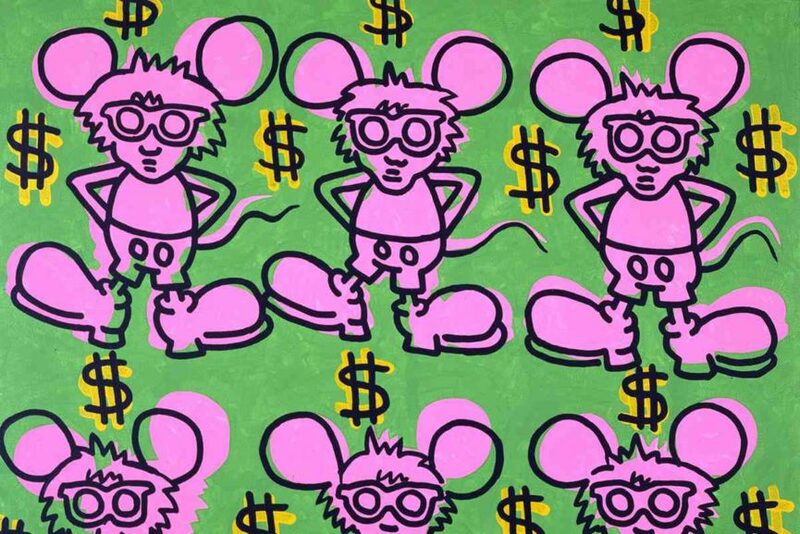 The Andy Mouse character appeared in many artworks by Keith Haring, such as this untitled painting from 1985, using acrylics on canvas. The Andy Mouse character evolved as a response to the friendship that Keith Haring developed with Andy Warhol, whom Haring had been a fan of. The images in the Andy Mouse series of images combine Andy Warhol with that of Mickey Mouse, sometimes surrounded by $ signs, or Haring’s distinctive figures. 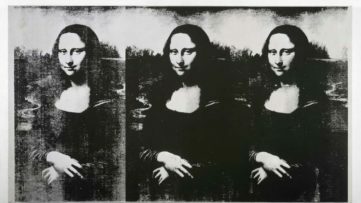 Some of the images made reference to the work of Warhol, such as this untitled painting, which uses a repeated motif that was popular with Warhol also. See more in this recent upcoming auctions article in which some Andy Mouse images were valued at $300,000 – $400,000. 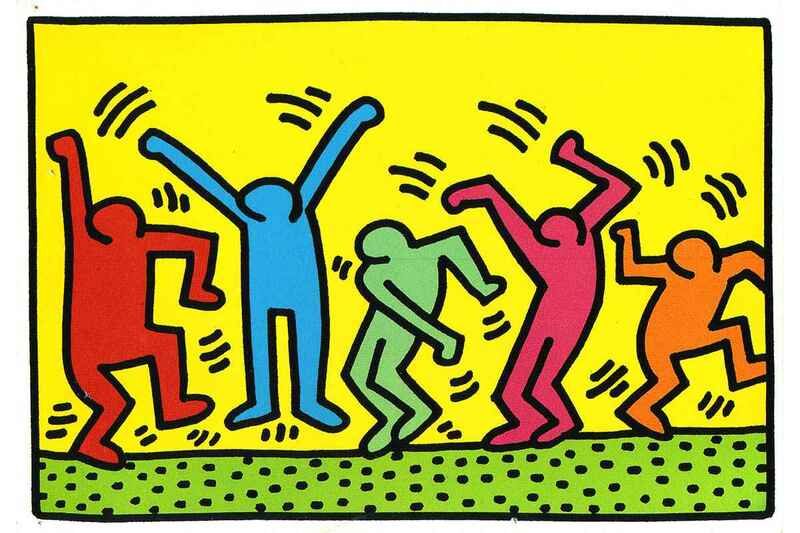 To end this street art legends series look at some of the imagery of Keith Haring, we can appreciate some of his simple pop art style figures. These images are uniquely that of Keith Haring, the style globally recognised and often copied such is their simple beauty. Despite a brief life, Keith Haring left a lasting artistic legacy with his unique vision and style of working; few artists have work that is so engrained in popular contemporary culture, making Keith Haring one of the biggest street art legends in the history of graffiti and street art. Visit The Haring Foundation for more information on their latest activities. All images courtesy of The Haring Foundation unless otherwise stated. Editors’ Tip: Keith Haring: The Boy Who Just Kept DrawingIconic pop artist Keith Haring comes to life for young readers in this picture book biography lovingly written by his sister. This one-of-a-kind book explores the life and art of Keith Haring from his childhood through his meteoric rise to fame. It sheds light on this important artist’s great humanity, his concern for children, and his disregard for the establishment art world. Reproductions of Keith’s signature artwork appear in scenes boldly rendered by Robert Neubecker. This is a story to inspire, and a book for Keith Haring fans of all ages to treasure. 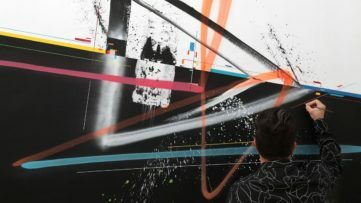 For all the news on street art legends, sign up to My Widewalls for free today!